In the early morning hours today, USA time, 11 April 2012 a major magnitude 8.6 MM earthquake hit in the Indian Ocean some 300 kilometers from the western coast of Sumatra triggering a tsunami alert for all countries bordering the basin. To make things worse the hundreds of aftershocks have also included a second major earthquake categorized at 8.2MM magnitude. Both of these major earthquakes have been initially registered at the relatively shallow depths of 23 and 16 kilometers respectively. 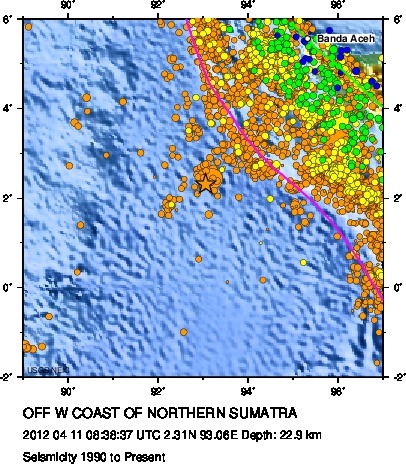 These twin seismic shocks of such high magnitudes have undoubtedly raised fears of a repeat of the catastrophe that impacted the same region on 26 December 2004, when an earthquake initially reported to have been of magnitude 8.8MM at a depth of only 30 kilometers generated a major tsunami that caused 200,000+ deaths mainly in Sumatra around the region of Banda Aceh. The earthquake of 2004 is still categorized as a 9.1MM magnitude event based in an analysis of all data, while scientists from the California Institute of Technology rate it at 9.2 MM magnitude. While we wait for damage reports from today’s Indian Ocean’s earthquakes it is clear that these shocks serve to remind humankind that we inhabit a hazardous planet, where we all are at one time or another vulnerable to the impacts of natural and human-made hazards. While the Indian Ocean and Sumatra may appear very far away to most of us in the USA, and they indeed are far away places, these natural events of just a few hours ago also bring home the seismic vulnerability of our fifty states. Such vulnerability is illustrated by records maintained by the United States Geologic Survey that show 54 magnitude 3.0 or higher earthquakes have hit somewhere in the United States over the last seven days, including at least one above 5.0 magnitude and five above 4.0 magnitude. 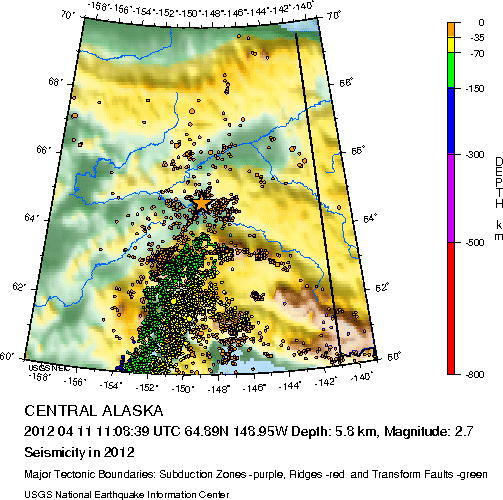 Most of these major earthquakes have impacted Alaska and our western states of California, Idaho, Montana, Nevada, Oregon, Utah, Washington and Wyoming. During the same week hundreds of minor earthquakes numerous magnitude ones and twos have affected the same states listed above and several others including Arkansas, Missouri, Oklahoma and Tennessee where at least five earthquakes have hit in the past week. Likewise, Hawaii and Puerto Rico and the U.S. Virgin Islands have been shaking in recent days. Let these alerts sounded by Mother Nature reminds all of us of the need to be aware of the vulnerability of the communities where we live, and of the need to practice hazard mitigation by incorporating design criteria and other measures into our houses and buildings, which will reduce the potential for damage from recurring earthquakes or other natural hazards such as hurricanes, floods, tornadoes etc. Pay attention! Be prepared!! MITIGATE!!! Previous Post5 April 2012 – It’s Florida’s turn!Next PostThere are ‘signs’ stirring in ‘our’ northern tropics!